The Carophile listing of top off-road motorcycle (also known as dirt bikes), is based on the “Smart Ranking” score published by Axle Geeks. The composite consists of the model year of the bike and a compilation of the average from dirt bike rating websites that include: CycleWorld, Motorcycle.com, MotorcyclistOnline, Motocross Action Magazine, Motorcycle USA, TransWorld Motocross, and Dirt Rider Magazine. The starting price for each bike is the average found for the make and model of off-road motorcycle; however, consumers may find variation in the price based on geographic location and condition of the bike. The 2015 Yamaha YZ250F is one of the top off-road motorcycles sold today. The popular bike has a starting price of $7,590 USD, and is powered by a 249cc 4-stroke engine. The combined rating of the model puts it in the top of its class, and the price is in the upper range of equivalent models. 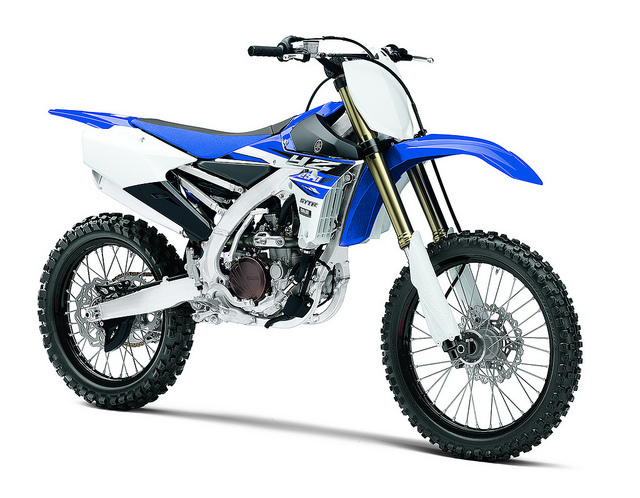 The engine size is slightly smaller than other 4-stroke models sold today; however, the two gallon fuel tank is slightly larger than average giving the YZ250F more range than competing bikes. The engine has a cylinder bore of 77 inches and a total stroke of 53.6 inches that result in it being oversquare. This allows the engine to generate more power than one that has a smaller bore.